Since my last post on Mercedes almost a year ago, I am sorry to report that the experience with Mercedes not only didn’t improve but actually has gotten worst. In late January 2017, we finally got the car we ordered in October 2016 and promised would be ready before Christmas 2016. Five months into the car’s young life, we noticed the car’s computer system was having some issues. At one time the car just died after we stopped at a traffic light and wouldn’t start again. Dealer informed us that a faulty switch causing the computer to shut down. It was a safety concern and they fixed it a couple of days later while we waited at the shop. Since December, we started noticing the car makes loud squeaking noise sometimes when we hit the brake or backing up. It was close to the one year manufacturer recommended maintenance time, we decided to wait until after the New Year to take the car in to the dealer for service. January 2018, called and scheduled the maintenance. We were told that for services such as maintenance, loaner car is not provided per Mercedes’ company policy. What? That’s news to us but alright we will just wait at the shop again then. And, by the way, the manufacturer recommended maintenance service is NOT covered by Mercedes and we have to pay for it. No one mentioned that to us before we brought the car! We are talking about just basic annual manufacturer recommended maintenance. One would think a premium luxury brand such as Mercedes should have that covered! Even the Honda Odyssey we brought provided 3 years basic service in 2003. What about the loud squeaking noise the brake makes? Oh it happens when the weather gets cold and nothing can be done about it, according to Mercedes. What!! Really?? Our 13-year old ML-320 didn’t make that noise. Nor did the X3, Mini Copper, or the Honda. How can a not yet one year old Mercedes makes loud noise and it’s normal and nothing can be done about it. What happened to Mercedes’ high quality standards and customer experience?? We will be shopping for a new car soon and it will NOT be a Mercedes. In fact, it will NOT be a Mercedes for a long long time!! Many years ago, Mercedes Benz used to boast about ‘The Mercedes Experience’ to show customers/potential customers how good their products are and the superiority of their services. My husband and I used to joke about our ‘Mercedes Experience’ when we were owners of the 2000 ML320. I still remember vividly the very nice salesman Roberto at the Silver Star dealer in Long Island City that sold us the car in 1999 (for the 2000 model). Our initial experience was very positive and we enjoyed driving the ML320. As the car aged and we went to a different dealer that was closer to home, the experience changed. By year 5, we started to see issues with the car and had to visit the dealer more often than we liked. The Service Manager would say to us ‘well, it is still a car’. I guess that was their justification for why the car had to be serviced frequently. But it’s a Mercedes, NOT a Honda! See my 2007 post about the ‘Experience’. So when we were looking for a new car in 2012, we decided to go with BMW, not Mercedes. We got the X3 in silver on a 3-year lease the way I liked it. We had never leased a car before. I loved the X3 but not the lease method. The Habberstad BMW dealer’s customer service is superior and unparalleled. They followed up with every appointments and survey after services. A lease meant we have to shop for another car again last year. The X3 was a great car but the design has not been updated for 7 years so we wanted a different one. For reasons I can’t understand, my dear husband is also very adamant about NOT getting another BMW as a replacement. After much research and comparison, we decided to give Mercedes another try. The newly introduced 2nd year GLC300 seems like a very good crossover vehicle and perfect for our needs. On October 10, 2016, we went to the local Mercedes dealership and ordered the 2017 GLC300. The salesman said it should take about 2 months and we would get the new car around the time our X3 lease ends on December 7. Great. Looking forward to the new car. December 6, one day before I had to turn in the X3, I called Mercedes to confirm that they had or would soon have the car for me. I got the manager on the phone since the salesman was not in. The manager was surprised to learn that I had not gotten a call from the salesman because my new car was not ready. In fact, it hadn’t even been built yet! He said the salesman would work with me on a solution regarding the lease car that I had to turn in the next day. A loaner car could be the answer. The next day, the sales guy called to say that I should extend the BMW lease and the new car would be ready 1st week of January. And he would call me before that to let me know the status. Thanks to BMW’s financing group, I was able to extend the lease another month and didn’t have to go through extra steps. The lease would end on January 7, 2017. Since we don’t live in the city, public transportation is not readily available and we rely on cars heavily. Without the X3, we are down to one car, a Mini Cooper, the ‘hockey puck’ as we call it. Not only is it inconvenient, when it snows we can’t drive the Mini. On January 13th I called the sales guy for a status on the new car. Now I was told that the car had been made and was on a boat somewhere coming from Germany. It is expected to arrive on January 24th in Baltimore. I expressed my concern that the car had been delayed from early December to early January. And now it is changed to late January or more likely February. We need to have an alternative until the car gets here. The sales guy said to come in on Monday to discuss the car and he would speak to his manager about a loaner car. Monday, January 16, we went to the dealership. From our discussion, it was crystal clear that the salesman had never intended to provide us a loaner car. And it was also clear that he didn’t really care about the sale since the GLC was a popular car and he would have no trouble selling it. That may explain why the guy had never initiated a call to provide update on the delays. As a customer, I had to call for an update every time! I am once again very disappointed at the ‘Mercedes Experience’. I was hoping that things had changed since we last owned a car from them. What do we do now? The GLC300 received great reviews and seemed like a really good car. However, do I really want to go through this ‘experience’ again? I don’t even have the car yet and I am being treated like this already. Imagine what it would be like after I sign the dotted line? The Jaguar F-Pace is looking really good right now! Everybody knows Federal Express ships stuff and believe it is a reliable company to get the job done. Well at least that’s what I thought until now. On September 18 I shipped two cases of wine to one of my customers in Manhattan. When the Fedex guy picked up the two cases, I asked if Fedex ships wines since the cases are fragile and easy to break. The guy said ‘oh sure, no problem’. I told him the two cases are quite heavy and please handle with care. “Sure” replied the Fedex agent. I assumed all is well and didn’t think much about it until my customer called a few days later and asked if I shipped the wine. September 25, I called Fedex to followup on the shipment tracking since I had not heard anything about it and my customer is asking. Fedex told me 1 case was damaged and was being ‘send back to shipper’ and they need to trace the second case. September 26, I called and a Fedex agent told me the tracking case is now closed. The shipment was damaged and will not be delivered and I should file a claim. I filed the claim online right away. October 7, I received a letter from Fedex dated 10/1 that the claim was denied because it did not meet Fedex requirement for shipping alcohol. What requirement? So I called Fedex and spoke to a lady named “Daphne” from the claims department. I was told that I need to have an agreement with Fedex in order to ship wine. Since I don’t know about the agreement therefore don’t have it, my claim is denied. I asked Daphne if this is Fedex policy then why didn’t the Fedex guy ask me if I have the agreement and allow to ship wine. I specifically asked him if I can ship wine before he pick them up. Daphne said the guy doesn’t have the information and only the claims department know that I don’t have the agreement in place. In other words, Fedex will take my business and my money but will not assume any responsibility on the shipment even if it is Fedex’ mistake. I asked Daphne what did Fedex do with my 2 cases of wine. If they were damaged and couldn’t be deliver and I am not getting any reimbursement from Fedex, then I want my products back. Daphne said the products were damaged and can’t be returned and I am to take the loss. This is unacceptable and I asked to speak to her supervisor. She kept on insisting that the supervisor will give me the same answer and there is nothing I can do. I want to speak to a supervisor anyway. Daphne took down my phone number and I am to get a call within 24-48 hours. Also, I was told that I can’t email my case to Fedex and can only use phone call. I filed a complaint on Fedex’ online forum anyway on October 7. Next day, October 8, I received an email from Fedex saying the case is under review and they have routed it to the appropriated department for followup. October 15, no one from Fedex call yet so I called again. After few run around (>Gina>Keisha>Dennis>Tracy>Bridgett) finally talked to Bridgett, the supervisor. She informed me that since I don’t have agreement to ship liquor, Fedex will not reimburse me but I can sign the agreement now then I can ship. Really? I told her my call is about what was damaged and what Fedex plans to do about it. Going forward, my options are many and does not have to involve Fedex, especially with the experience I am having with this now. I asked Bridgett what happened to the 2 cases of wine that was ‘damaged’. What proof does she have that they were damaged and not ‘misplaced’ (like someone took them home if you know what I mean…it is liquor after all). I asked her what is Fedex’ internal policy in terms of monitoring and tracking shipments. I don’t understand why Fedex will gladly take my business and shipping fee but will not take any responsibility when it is their mistake that my shipment was damaged. I again asked to escalate the case and to speak to her supervisor. I am told that I will get a call within 24-48 hours. We will see about that. Is this how a reputable company handle business? Only concerns with generating revenue but does not take any responsibility? Why would anyone want to do business with Fedex? UPS here I come!! Stay tuned for further update on this ‘Fedex Nightmare Experience’ that you don’t want to have. Today is Saturday and I left the office after 3 in the morning but have the weekend off. 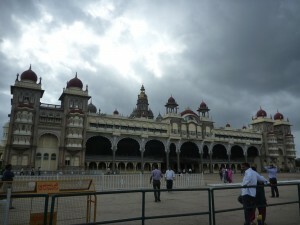 The plan for today is get a bit of sleep then go into Bangalore city center in the afternoon. Got up around 10 and went for breakfast at the usual place around 10:30. I was surprised by how busy it was in the hotel and restaurant today. It seems during the week days the people in the hotel are mostly business people staying for work. The weekend seems to have more local people coming in for a little treat for the weekend perhaps…more kids and more ladies, almost all indians except me and another gentleman. The hotel has a travel desk that can provide a driver and car to take people for sightseeing trips for a fee. I booked one for 8 hours today to see the city. Two people from my company’s supplier are also in Bangalore helping me on the project. It is their first time to Bangalore even though they are Indians and both from Mumbai. I thought it would be nice to invite them on my trip. Good for them to see the city and good for the company. Frist we visited the Shiva Temple in the city center. When we drove past the front entrance, I couldn’t tell that there was a temple anywhere. All I saw was construction and building materials on some store front. Then we went through a parking garage and paid a small fees to go inside. Took off our shoes and walked through some narrow and dim tunnels. We walked pass a lot of glass cases on the wall and small statue of various forms of Shiva. 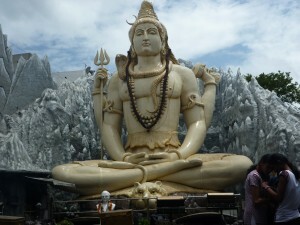 Then we got to the outside and there it is…a very large statue of Shiva. This is a very popular temple, especially on the weekends where people come for prayers and pray for their wishes to come true. I can’t remember what I wished for. 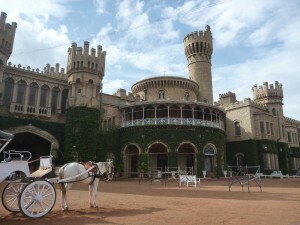 After some fun shopping and nice lunch at the Tandor Restaurant, we headed to the Bangalore Palace. It is 350 Rps to go inside the Palace but it’s free to see it from the outside. I started to take some pictures but the security guard right away told us “no picture” unless we buy tickets to go inside the Palace. Our guide and driver told us it is not worth it to go in as we will be going to Mysore where there is a much bigger and grander palace built by and for the same family with virtually the same architecture design. We took his advice and settled to just sit and admired the palace from the outside. I did take a couple of pictures before the guard stopped us. Today is the best day of this trip so far. I got to see the city of Bangalore, visited some nice places, and more importantly, I did some mandatory shopping and brought some very nice silk stuff for myself and the girl. It is day 3 in Bangalore and I am slowly getting into a routine. I was at work at 7 AM EST for both yesterday and today. That’s 4:30 in the afternoon local time. Yesterday was a long day. When I got back to the hotel around 4 in the morning, I went straight to bed. Then I got up a little after 9 (about 5 hours later) and made it to breakfast before they closed at 10:30. I took a two-hour nap and went to the gym for an hour. Then I went to work. I can’t wait for the weekend. It is a good thing that I only have to stay for another week. Everyday just going between office and hotel and sleep is not fun. Then have to work the grave yard shift makes it so much worst. Two more days until weekend!!! Then it will be shopping and sightseeing!!! In a few days, I will be going to India again for business. This time, I am going to Bangalore, the silicon valley for India where most international tech companies have presence in the area. I will be staying longer this time too, 13 days including travel time. This will be my third visit to India so there shouldn’t be any surprises. Since it will be the first time to Bangalore, I plan to have time for some sightseeing and be a tourist on the weekends. I hope it is not a bad omen that I am having issue to get an international phone before the trip even started. I currently have the iPhone 4 from Verizon and it is not compatible for international use. So I have to request an international loaner phone. I followed the company procedure and filled out the request more than 8 business days ago. I asked to have the phone to be delivered to me by Wednesday and today is Tuesday. I finally got a confirmation after 6pm that a phone will be fedex from Chicago to me by tomorrow. I hope I will get it tomorrow. Good thing I deliberately put in one extra day just in case. My last day in the office is actually Thursday, not Wednesday. So if necessary, I can still receive the phone on Thursday. Let’s hope all will be fine for the trip and the project is successful.